Check Calendar for list of dates and projects 1:00 pm to 4:00 pm on select Sundays. $10 for a family of four. $3 per extra person. Check Our Calendar for the Spring Classes start April 1st. The whole family can enjoy an art class at the WAC. Drop-In Studio Mixed Media Mondays! Mondays in the Oaks Gallery Classroom join our community of artists and paint, draw, collage, whatever your artistic heart desires! Take a class or rent our studio for Birthday Parties, or get togethers. Bring your class for a field trip! "Art Jam" hosted by Willamette Art Center at the Marion County Fair. We will have live Raku firings, kids table, local artists, and demonstrations from our instructors. Artists and craftspeople teach, demonstrate, and show off their skills. Our annual benefit sale for Marion Polk Food Share will take place the Saturday before Thanksgiving. Raku is instant gratification! Glaze and fire in a day. 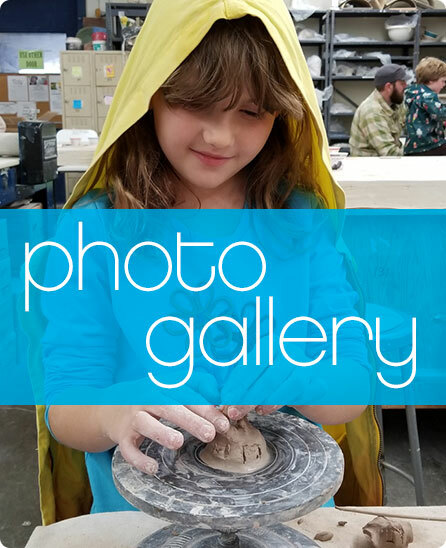 The WAC proudly offers classes in ceramics — both hand-building and wheel — for adults, teens, and children.